The Florida Track Club (FTC) is the oldest continuously operating track club in the U.S. It is known not only as the home and training base for prominent runners such as Olympic gold medalist Frank Shorter, Jack Bacheler, and Jeff Galloway, but also for setting important precedents for modern track clubs: FTC was the first track club in the U.S. to be granted tax-exempt status, and the first in which competitive athletes had the majority vote on who would go to meets and where they would go.2] FTC was also largely responsible for establishing its hometown, Gainesville, Florida, as a mecca for serious competitive runners. FTC was founded in 1965 by University of Florida and Olympic track coach Jimmy Carnes and Jack Gamble in Gainesville, Florida. Upon moving to Gainesville in 1965 for his career in environmental engineering, Gamble, a former college track and field athlete who wanted to stay involved in the sport, reached out to Carnes and volunteered to officiate and otherwise help out at events. The two started an informal group in which Gamble would recruit prominent runners to give talks. One day, Carnes asked Gamble if he could help raise money to send a team to a relay race at Madison Square Garden in New York—he’d been expecting a check, but it hadn‘t yet arrived. Gamble immediately started fundraising among other runners at the University of Florida and brought the money he’d acquired back to Carnes. However, by that time, the check Carnes had been expecting had arrived. Since most of the donations Gamble had solicited were in cash, and he hadn’t kept track of who had donated what, he couldn’t return the money. Carnes and Gamble felt obligated to put the funds to good use for the running community. Gamble consulted with Ed Singley, a colleague from work who had experience setting up organizations and handling finances. By the end of the day, the Florida Track Club had come into being, with Carnes as its executive director, Gamble as its president, and a bank balance of around $800. Soon after, Carnes and Gamble met with a number of other local runners at Gamble’s house to develop a plan and a vision for the club. Besides being accomplished runners, many of those attending this first meeting brought useful professional skills to the club’s founding. One of them, John L. Parker, Jr., had a law degree and used his legal skills to draft an official charter for the club. (Parker’s novel Once a Runner, a cult favorite among runners, is a lightly fictionalized account of the early years of the club.) Another, Olympic distance runner Jack Bacheler, designed the club’s logo, an image of a Florida orange, making a point of ensuring the image in the logo was botanically accurate. An innovative feature of the club was that it was organized so that a majority of the board would be competitive runners, and these runners would decide who got club support to attend meets and which races they’d attend. This strategy was designed to ensure the best athletes for each event would get support and avoid the political favoritism that occurred in other clubs. This policy was unique among track clubs of the time. Gamble stayed president for about 3 years, after which time the club instituted regular elections. During Carnes’ years coaching the club, he noticed his runners tended to be in better condition during indoors winter meets than runners from northeastern schools. He attributed this to Florida’s weather, which allowed for long outdoors workouts during the winter. But Florida’s punishingly hot and humid summers also proved a useful training tool. In the 1968 Summer Olympics in Mexico City, Jack Bacheler, an early club member and top-ranked two-miler, was the only U.S. runner able to run strongly enough at Mexico City’s high altitude to qualify for the finals in the 10,000 meters. Unfortunately, he was selected for random drug testing after the qualifying race and when unable to produce a urine sample, was coaxed to drink some local water offered by race officials. The unpurified water gave him such severe digestive distress he was unable to compete in the finals. Nevertheless, serious runners took note of Bacheler’s success in the preliminary races, which Carnes attributed to Bacheler’s training regime of two or three daily runs in Gainesville’s summer heat—this apparently gave him the conditioning he needed to run efficiently at high altitude. Other serious competitive runners, wanting to replicate his success, soon began moving to Gainesville and training with the FTC. By the 1970s, the FTC had become the training home to such prominent runners as Jeff Galloway, Frank Shorter, and Barry Brown. In 1970, the year Shorter joined the FTC, the club won its first national championship at the Track and Field Federation meet. In 1971, FTC won its first AAU cross-country championship and retook the title twice, in 1972 and 1973. After Shorter took the gold medal in the marathon in the 1972 Summer Olympics in Munich, the club’s popularity exploded—as did serious interest in long-distance running. It was during this era that Gainesville became known as a mecca for elite competitive runners. At this time, competitive running adhered to a code of strict amateurism—runners could not receive any compensation for their running apart from payment of their expenses. The mere suggestion of an improper gift or excessive reimbursement of expenses was sometimes enough to get a runner banned from competition. To help FTC runners support themselves while adhering to this standard, Gamble arranged part-time landscaping maintenance jobs for them with UF’s Plant and Grounds Department. He also arranged for local hotels to let runners stay in unoccupied rooms. Carnes, who owned some investment properties in Gainesville, opened some of them to runners as well. In addition, Gamble even had some runners stay with him in his own home when first arriving in Gainesville. On top of his running achievements, Shorter also changed track and field history by forcing a change in the longstanding policy of strict amateurism for runners. After becoming a household name, he began manufacturing and selling running gear and pushed back when told he couldn’t wear one of his own branded shirts. Realizing the absurdity of this constraint, officials relented, and the policy of strict amateurism soon ended, paving the way for today’s professional running circuit. While the initial group of runners in the club were men, a few serious female runners were also active members of the club in its early years. The most prominent of these was Margaret Tolbert, who, along with her sister, Jane, had been tennis players UF, but also had an interest in running. Opportunities for women to run competitively at the college level were limited at the time, and the longest race available to them was 1 mile, which put Tolbert, whose aptitude was for distance running, at a disadvantage. Moreover, track training for women was constrained by the small number of women interested in running as well as conventional standards of femininity. Another early contributor the club was UF medical researcher Robert Cade, who led the team that invented Gatorade. While developing the still-unnamed sports drink, which was intended to promote better endurance and prevent dehydration in athletes, he tested it on UF and FTC runners. At one relay marathon, he set up tents at set points along the course, where his researchers took blood samples from runners, comparing those from runners who had consumed his formula to those from a control group. These findings contributed to the refinement of his formula. After Shorter’s victory in the 1972 Olympics, distance running captured the public imagination and running became a popular mainstream activity. During this time, recreational runners, most new to running, began joining the FTC. This changed the profile of the club from one populated purely by elite competitors to one serving both serious competitors and novices. This led to some tension between the two groups. While FTC continued its original mission of training and supporting elite runners, some of the recreational runners felt their interests weren’t being properly addressed by the club—they wanted to club to organize more road races and other activities for the community at large rather than focus the club’s resources on competitive training and track meets. Moreover, as the club’s superstar runners of the early 1970s started to retire, some questioned the club’s heavy investment in the less-storied competitors who followed. Some FTC members, however, were uncomfortable with what they perceived as the commercialization of the club. The Athletic Attic team then disassociated itself from FTC and became an independent team. In 1978, a group of recreational runners decided to form a separate organization, the Florida Road Runners, which would focus on road races and other activities for recreational runners. True to its name, the FRR organized numerous road races, which attracted large numbers of local runners. Within a few years, however, the FTC had independently chosen to shift more of its focus onto the growing population of recreational runners and started organizing road races of its own. By 1980, both groups were regularly hosting weekend races and even found themselves hosting overlapping races. David Mathia, one of the leaders of the FRR, realized the groups had come to share the same mission and constituencies and thus were duplicating many of their efforts. For this reason, he reached out to Len Ryan, the president of the FTC at the time, and proposed a merger of the clubs. Ryan agreed, and by 1981, the clubs had merged memberships and the FRR had been reabsorbed into the FTC. Following the merger, Mathia became FTC’s race coordinator. After the first few years of the GGRR, Rothman and Liquori were ready to move on to other ventures, and ceded control of the race to the FTC. Over time, however, prize purses for professional runners grew, along with the number of high-profile opportunities for them to compete. The GGRR was eventually unable to offer either enough prize money or prestige to attract top runners, and moreover, the now-crowded professional race schedule meant it often conflicted with more popular events. The growth of recreational racing opportunities also meant the GGRR competed against other local races. Thus, the GGRR was discontinued in the early 2000s. However, the FTC continued to sponsor a series of popular regular races, including the Newnans Lake 15K (which many runners used as a warm-up race for the 5 Points of Life Marathon and Half-Marathon typically held a few weeks later), a half-marathon, and the July 4 Melon Run, one of FTC’s oldest traditions. 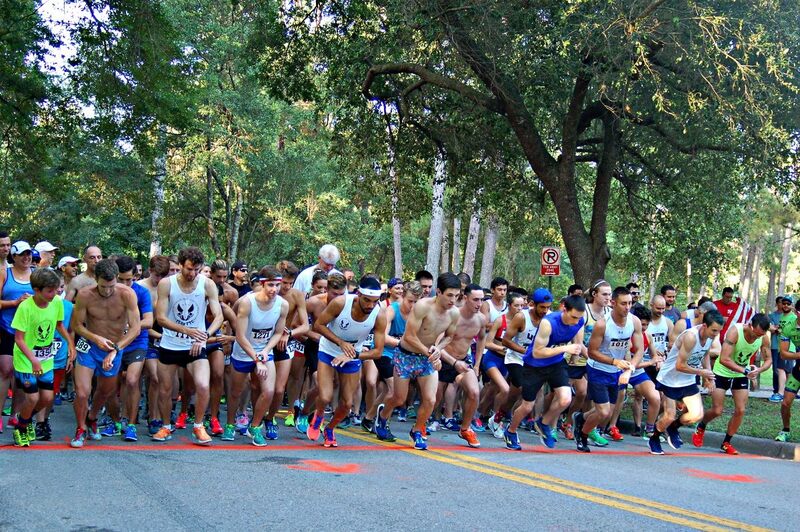 While the FTC had a regular marathon training group and members regularly participated in out-of-town marathons, Gainesville had no regularly scheduled marathon of its own until 2006, when the Five Points of Life Marathon was first organized. While the majority of FTC members in this era were recreational runners, elite competitors as well as serious amateurs continued to compete in FTC races. Thus, race organizers took care to measure the courses accurately to ensure that participants could use their times to qualify for elite races such as the Boston Marathon. Today, the FTC continues to serve both recreational and elite runners, and currently boasts over 300 members. It has also expanded its mission to educating the community at large about running, and thus has expanded its activities to accommodate runners of all ages and abilities. Among its popular current activities are the annual 4th of July Melon Run (3 miler), the Tom Walker Memorial Half-Marathon and 5k (typically held around Veteran’s Day, the June Twilight Track Meet held at the University of Florida, which includes track and field events for competitors of all ages, and the Frank Shorter Road Mile, a New Year’s Day road race on a USATF certified course. In addition, FTC members regularly volunteer as pacers for the annual Five Points of Life Marathon in Gainesville. FTC also has a series of regularly scheduled group runs open to the public as well as monthly talks by prominent members of the running community. In 2015, FTC began offering scholarships to help cover the travel expenses of members participating in out-of-town races. Unlike the funding provided to runners in the early days of the FTC, these scholarships are available to recreational as well as elite runners. (The only requirement is that recipients wear the FTC singlet when racing and report back on their experience at the FTC’s monthly meeting.) As of 2017, over 20 scholarships have been awarded. Over the years, a number of prominent competitive runners have trained with the FTC. While not all were official members of the club, all trained at least part time in Gainesville and participated in FTC activities.